Greg Rucka has been one of my favorite writers since I first read his Whiteout series so I have at least checked out most of the books he has worked on since. So when I saw a preview for Black Magick in the back of Lazarus last month I added it to my pull list the next time I was in my LCS. Plus how could I pass up a Rucka book with art by Nicola Scott??? Rowan Black is deep in the Wiccan beliefs, but she is also an officer in the Portsmouth Police Department. And it is quickly made clear that these two factors in her life are constantly at odds with each other. As evidenced by the opening of the book which features a group of women wearing nothing but cloaks who are in the middle of a ritual when a cell phone interrupts them. A call that pulls Black away from the ritual to a hostage situation at a local burger joint where the hostage taker is demanding to talk with Black specifically. After a little interaction over the phone the man agrees to let the hostages go if Black will agree to turn herself over in exchange. A deal that Rowan knows must be made. So she hands herself over and gets the innocent people freed but is shocked that the man knows a lot about her including her true name which in witchcraft is a powerful weapon. It is also quickly made clear that the man has been hired by someone else and that he is being forced to kill Black by the mysterious higher power. Rucka grips the reader quickly with the dark world he is creating and the characters that are inhabiting it. He builds tension slowly and expertly all the way up to the shocking final moment where Rucka hints at what is to come for Rowan Black and her two lives. The art of Nicola Scott is amazing. 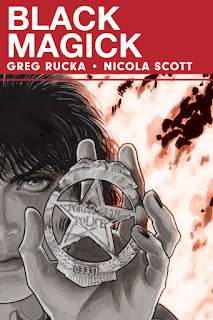 In fact I would even go so far as say that Black Magick is the best Nicola Scott art I have ever seen. Her line work shows a great patience and attention to every detail in a panel. And it was a great decision to have the art start almost black and white and slowly bring in little tints of color up until the final moments of the hostage situation where there is a sudden burst of color that makes the moment way more intense. I am going to stay on this book for it’s run. It has a compelling mystery building in the background and a great concept that has a lot of room to be explored.